Have I mentioned before how much I hate winter? Well I do. It didn’t bother me when I was younger but for the last 10 years or so it makes me cringe when the days get short and the dark falls earlier and earlier. I have never been a big fan of cold and snow, but I just hate it more every year. I hate the dark; short days; gray weather; all of it. OTOH, I do like that the temperate climate where we live at least has seasons. I don’t mind the change, I just wish winter didn’t have to be one of them. I would not be happy living any further north, that’s for sure. Fortunately our winters are mild with only an occasional snow or ice storm. I have been putting off posting because I had hoped the second Owl Vest would be done to show you and it almost is. I only have to finish the armbands and weave in the ends. Here’s the best picture I could get indoors today, due to the afore mentioned crappy winter gray days. I should be able to finish the rest up tonight. 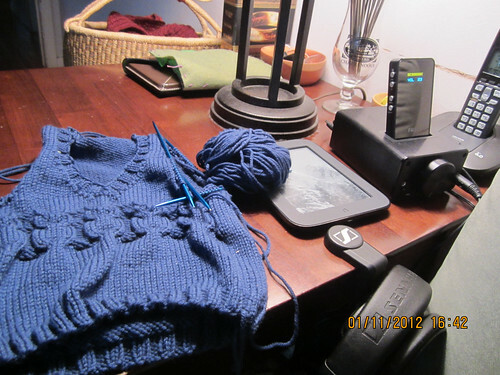 Did you notice that gadget next to my Nook? That’s one of my most recent acquisitions to my audiophile equipment collection, my new Fiio E9 Amp and the little thingy inserted in the slot on the top is the Fiio E7 portable headphone DAC/amp (which for the non-audiophiles is a digital to analog converter, i.e. 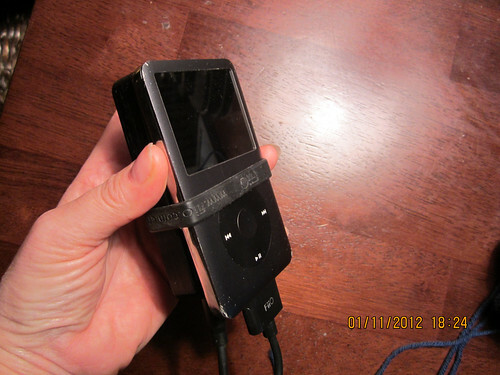 an external sound card and amp). I hook these up to my computer via USB. I can also use the E7 alone with my iPod if I want to. 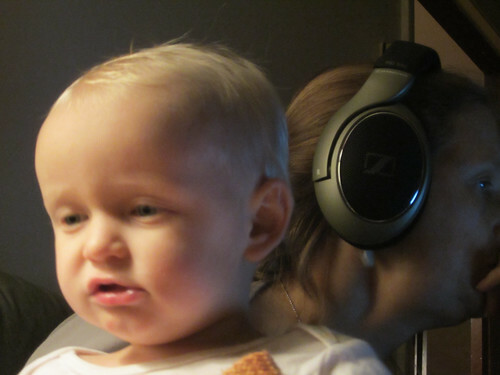 I have a really nice set of Sennheiser HD595 headphones which benefit greatly in sound quality from an amplifier. I freaking love these things. You don’t realize how much detail you can be missing in your music until you hear a fine set of cans with a decent amp. Night and day people. Seriously. I have done a little knitting retail therapy too. Helps with the winter thing. Heh. 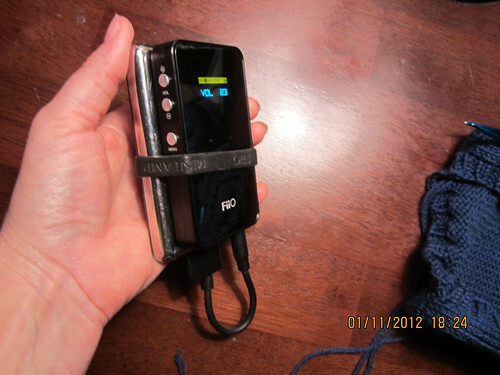 I recently ran across the new ( I think) Knitter’s Pride Nova SP needles at Web’s. I prefer using straight needles when I can and really love my nickel plated DPN’s so when I saw these I ordered a set in every size from 0-8. I rarely use anything bigger, and really don’t even use the 8’s that often. I used the 6’s last night and give them 5 stars. They are pointy and slick, which is how I like them. The price is great too. 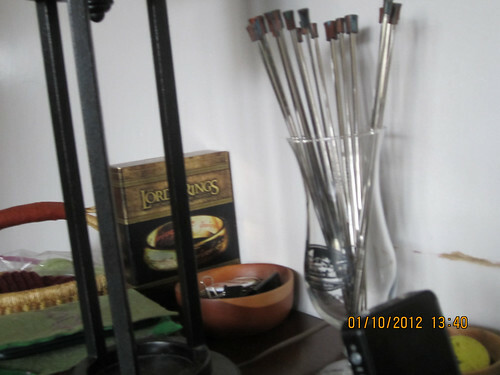 That’s them in that glass next to my lamp. Kyla must have taken that one. 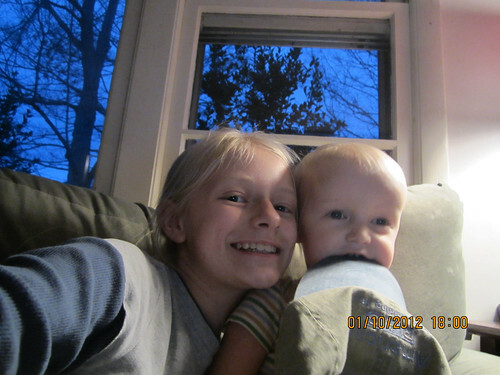 She and Elijah were doing a photo shoot yesterday. 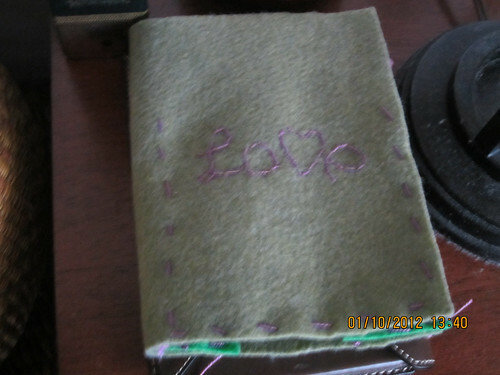 She took a picture of the Nook cover she made for me at Christmas. I got her a bunch of embroidery supplies for Christmas, at her request, and I was the first recipient of her new stash. I got her off to a good start on the stash building. What can I say? I am a sucker for any interest in needlework in the offspring. Here’s one of the cutest out of the bunch. Not bad for a self portrait. I don’t know why all my pictures have that little time/date stamp on them now. I must have accidentally changed a setting on my camera the other day. Will have to look into it since I think it detracts from the picture.